Recent U.S. attacks on Venezuela have generated a widespread international response. Good willed people from all walks of life have come forward to express their solidarity with the Bolivarian revolution and their opposition to intervention. This is inspiring and leads one to conclude that there is generalized dissatisfaction with the global system and, together with it, a willingness to be critical and work for change. Naturally these defenses have focused on imperialism, intervention and interference. The overall consensus is “Hands off Venezuela.” This slogan is a good one, since every thinking person today defends democracy, and a condition for democracy is that nations maintain (or attain) their sovereignty. (Nothing could be more antidemocratic than having foreign powers interfere in a country and have them sponsor foreign-appointed pretenders such as Juan Guaidó). However, this focus on imperialist interference, correct as it is, has sometimes led to an apparent indifference to the content of the revolution and its internal dynamic. One might think that the oversight is actually for the better since internal affairs are “none of our business, but rather the responsibility of Venezuelans.” Yet I think that this sidelining of the internal dynamic and contents of the Bolivarian process is mistaken. Although it has been a pattern of internationalist behavior for some time, I believe it is not necessary and could be even harmful. From the start, the Venezuelan revolution skillfully interpellated people from all around the world. It said to them: Our struggle is your struggle, your struggle is our struggle. That is not just a tactically useful position but is actually scientifically correct. For this reason, the Venezuelan revolution declared from the beginning that the problems of neoliberalism, imperialism, and later capitalism, were not unique to Venezuela. They were challenges that peoples from all around the world faced, and it invited people to join in a common struggle. These hypothesized solutions developed over time. The Venezuelan revolution first proposed popular, participative democracy to solve the problems created by neoliberalism. Later, it concluded that this kind of democracy had to be extended to the sphere of production to be real democracy, and this led to proposing socialism as the way forward. Finally, the revolution refined its socialist proposal by hypothesizing that communes are the key to realizing democracy in the area of production. 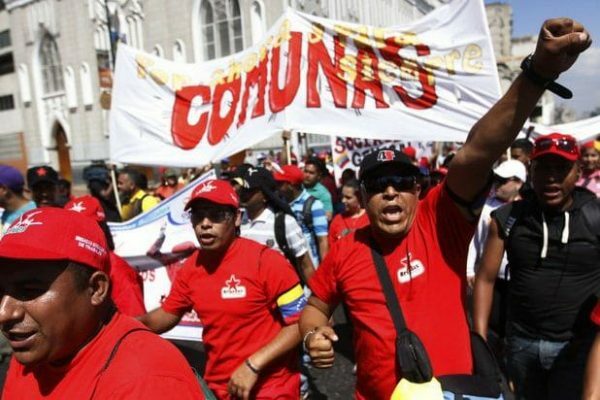 It is important to recognize that the commune is not just a whim, nor is it part of some endogenous “Venezuelan path to socialism,” but rather a solution to a universal problem. This is because capital subordinates society through a diffuse metabolism that is essentially hierarchical, implying that there has to be a diffuse nonhierarchical environment to overcome it. The commune is that proposed nonhierarchical and democratic environment for production and life. Any or all of these ideas could be wrong. Nevertheless they are solutions proposed to overcome shared problems. Therefore, they propose to be universally-valid solutions for how to overcome imperialism and capitalism. Coming back to the question of imperialist interference and how to oppose it: It is one thing to show the criminality of imperialist interference—it is indeed criminal—but it is a more powerful gesture to show that popular democracy can confront imperialism (a takeaway being that popular democracy in your own context, be it Nigeria or Nepal, could confront imperialism). Finally, it is an even stronger idea to show that socialism—that is, democratic, self-governed production—could lead to a world without imperialisms (that is, a world in which the imperialist motive would not be operative). So when intellectuals defend Venezuela, why not put the cards on the table and say that we also defend popular democracy, socialism, and communal production? The orthodox, time-honored answer is that we need the most ample alliance possible and cannot risk offending people who maybe don’t like popular democracy, socialism or communal production. This argument is a bit like the old claim that we need the support of the progressive bourgeoisie (which, these days, is a bit like looking for the philosopher’s stone or the unicorn). Of course, we may need to choose our words carefully (since some words, such as “communism,” have been victims of so much propaganda that they might alienate the masses). Yet it remains undeniably true that defending popular empowerment and social justice through a complete transformation of the current system would incorporate more people than it would turn off. So why do spokespeople and intellectuals so often backburner these aspects of the Bolivarian revolution in their discourse and their defenses? There may be motives that are honest, including simple ignorance of the revolution’s contents (which as long as it is not willful ignorance is understandable). Nevertheless, it is extremely probable that many right-wing elements inside or associated with the process, including intellectuals, actually use the crisis to advance their agenda, which involves eliminating the Venezuelan revolution’s proposals for how to achieve social justice and popular power. These right-wing elements are surely delighted to see the shifting of goalposts that is taking place in the public sphere. Once intellectuals in pro-Bolivarian contexts defended popular democracy and socialism, but now they defend just sovereignty. Perhaps mere shared sovereignty will be the next goalpost they defend. However, the law of diminishing returns does not have to operate in the field of international solidarity. Internationalism can take the right-wing path of empty or formal defense, in which the content of the Bolivarian process is ignored, or it can take the left-wing path, in which sovereignty is defended along with the social project. The latter defense is not only the correct one for those who struggle for a better world; it is also the only consistent one, since there is no sustainable basis for national sovereignty in peripheral countries except popular power. Furthermore, a left without the capacity to imagine and project a better world—call it socialist, communal, or self-governing—is a virtually useless one.